One of the exceptional joys of my life is time with my precious parents. Aside from their warmth and love I learn valuable lessons in living from both in different ways. Today, a little bit about the things that my father taught me. He taught me the value of sharing, of generosity. He once dedicated a room in our house to an employee who worked with him for 40 years and stopped when he couldn't do more. I fondly remember him as Mohan Lal. He's in his village and we still refer to the room with his name. Today, I share what I've learnt and am open to your contributions, too! Dad wasn't born rich. In fact, he lost his father when he was 4 and started work when he was 10 and still in school. He did odd jobs like distributing newspapers and continued his education at the same time. His mother knew that he would make a success of his life and was among the happiest when he secured a position in the Ministry of Commerce. Every day, before his office hours started, he would bicycle to Ghaziabad from Delhi for a degree in Economics. His regret is that he didn't own a car to take his mother to the hospital when she called him for help on the day that she passed. He remembers his mom calling him by his name, "Sunder", before she passed on. He carried her on his shoulder when the taxi arrived and she breathed her last! 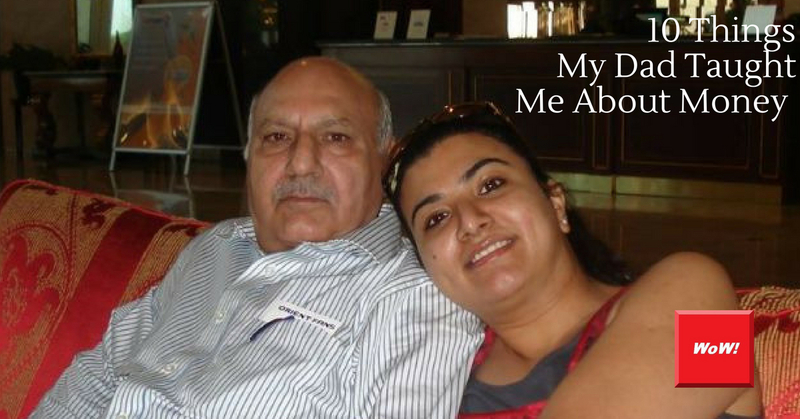 My father dreamed of owning his own business. So, first, he set his brother up in the new business in electronic goods. As work grew, he took a giant step - he left the safety of a permanent government job! Even today, most people would think twenty times before leaving behind security of a guaranteed paycheck and pension. But he bet on his own future and emerged a winner and a distinguished business community member. Here are a few things I've learned from a man who inspired me to follow my own dreams. 1. Save, no matter how much you make. He says he always lived within his means - whether he earned Rs.50 or more. 2. Have a life partner who plays on the same page. No matter what they had to sacrifice, he and my mom saved. They made wise spending and investment decisions. My dad has full trust in my mom's spending wisdom. 3. Be focused on your dreams & be disciplined. My dad left for work every day without fail at 9am, and returned between 8 and 10pm. He did that for years, and continues to do that today. He says that being focused and disciplined plays a major role in creating a valuable business, satisfaction and wealth. 4. Have a road map to your goals. He created a road map around financial security and his career, on how he wants his life to go - and it has gone just the way he wanted. 5. Build strong relationships. His relationships are marked with trust and respect for workers, customers, and the business community. Most of the them have been with him for 40 years or more. 6. Invest your money. There was a time when he doubled his money by investing in NSC and other investments. He says he made many wise investment decisions. And, yes, he lost money too - in the stock market. But, that never comes in my way. He says if you've understood how it works, go ahead. He says he couldn't figure out. Isn't it amazing to have a father who lost money in the stock market and still believes that there is money to be made there - it's only to be figured out how?! 7. Live in abundance. I grew up in abundance and was nurtured from abundance. My dad believes that there is a lot of money for everyone in this world if they work towards it with persistence. Build a mindset that helps you to create money and operate from abundance is his message. 8. Be a conscious spender. I have never seen more than 7 pairs of clothes and 2 shoes in my dad's wardrobe. He is a minimalist! And, believes in buying only what he can manage. I've seen him wearing good branded clothes since I remember. Though he remembers the time when my mom used to make new collars for an old shirt of his as they couldn't afford buying new shirts. Conscious spending is his message! 9. Keep some for rainy days. No matter how much you grow, keep your feet on the ground. He taught me humility and building an Emergency Fund to take care of whatever rainy days may show. What are your thoughts? I'd love to hear them!